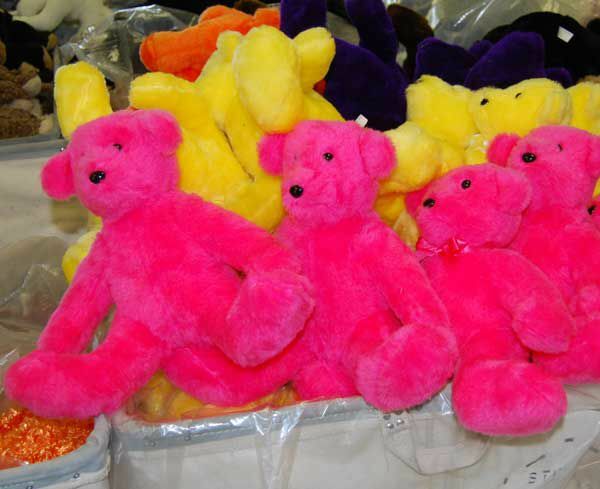 Stuffington Bear Factory has been making stuffed animals in Phoenix since 1959. They have only one location where they design, sew and retail their teddy bears (and dogs and rabbits and other animals) all by hand. Aside from the retail operation Stuffington Bear Factory has commercial clients who special order from them because they especially want products that are totally made in the U.S.A. from materials manufactured in the U.S.A.
Six days per week the folks at Stuffington Bear Factory allow people to tour the facility for free. During the drop-in tour you'll learn about the history of the teddy bear, and actually visit the manufacturing floor and see how the stuffed animals are created. At the end of the tour (or even if you didn't take a tour) you can purchase a ready-made stuffed animal at Stuffington, or you can stuff your own. Outfits and accessories are also available for purchase at the store. A little bear told me: Stuffington Bear Factory is one of the last remaining stuffed animal factories in the country. The daily free drop-in tour is for everyone, from stroller age to adult, for groups of 10 people or less. On your tour you may see girl scouts or Red Hat Ladies, but mostly you'll see parents and kids who just want to do something different and fun. Pictured above: The tour begins in a conference room where an employee will talk to the group for about 5 minutes about the history of the teddy bear. A little bear told me: Stuffington Bear Factory used to be located on Washington Street, but moved to Thomas Road in 2005. After the introduction you'll be taken behind the scenes at Stuffington Bear Factory. There you'll hear about the process that they employ for making stuffed animals by hand, and you'll be able to see the manufacturing employees actually measuring, cutting, sewing and stuffing the stuffed animals that are being produced that day. Your tour guide will answer any questions you have about the bears or the company. The Stuffington Bear Factory is fun and educational, for both children and adults. A little bear told me: Sorry, but you won't receive any souvenirs at the end of your tour. You are welcome, however, to bring your camera and take a photo of the kids sitting on probably the biggest stuffed bear you'll ever see. Private tours, field trips, company meetings and birthday parties are common occurrences at Stuffington Bear Factory. They have several big, bright rooms where refreshments, cake and other activities take place for your group. Everyone can take a tour of the facility. Included in the cost of the party, every guest makes their own 12" teddy bear to stuff, bathe and comb. In the case of a birthday party, the birthday child gets an outfit for his/her bear and may add their hand print to the Stuffington Bear Factory birthday party wall of fame. I noticed some pretty large hand prints on my visit; that's a clue that not only little kids enjoy a party here! Stuffington Bear Factory is also a popular destination for organization field trips. Preschools, schools, boy scouts, camps -- they will gear the field trip tour to the age of the participants. The most popular field trip option is the Stuff Your Own Bear Field Trip. That plan includes a bear for each child to stuff, bathe and comb with ribbons and a bear birth certificate. A little bear told me: For parties you may bring in your own food or Stuffington Bear Factory can make the arrangements for you. Parking is free at Stuffington Bear Factory. The free daily factory tour (groups of 10 or less) takes place every Monday through Saturday at 1 p.m. Reservations are not required. The tour lasts about 20 minutes. Cameras are allowed. Private tours are only available for parties of ten or more. A little bear told me: Yes, all materials - including eyes, noses, fur and stuffing - are manufactured in the United States. Retail stuffed animals in the store and online start at about $20.